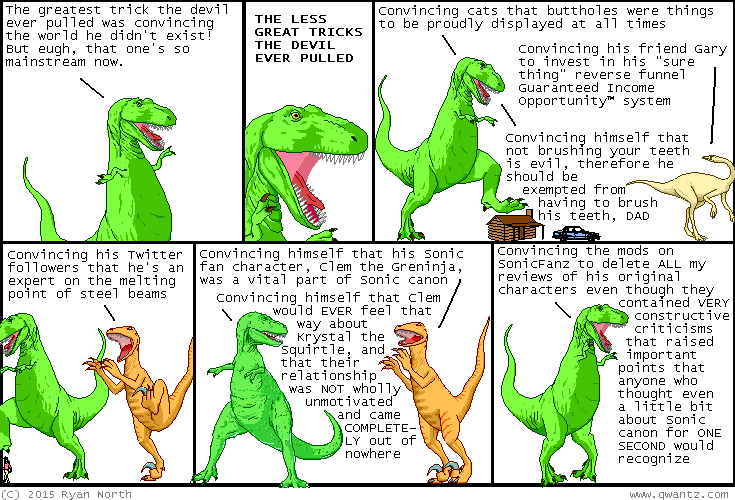 Dinosaur Comics - December 25th, 2015 - awesome fun times! –It's about a "man" who puts "everything" in "quotation marks"! December 25th, 2015: That's it for 2015, everyone! For the rest of the year I will run some KLASSIC KOMICS, and then we'll be back for 2016 and what I can only describe as... funny jokes, featuring dinosaurs?? One year ago today: NORAD has tracked His movements for half a century, for all we can do is stand mutely and watch as He seeds His madness.